We’re used to seeing lots of machines from York and over the years they’ve had some absolute crackers. Of late their offerings have been a bit of a mixed bunch from superb to not so great, so having been given the opportunity to test their 2-in-1 cycle cross trainer we approached the task with cautious optimism. Like all York machines, the assembly was straight forward and everything went together as per the manual instructions. A combination of the clear manual and well-machined nuts and bolts meant there were no hiccups and in a little under an hour, we were ready to go. The 2-in-1 is nicely finished and the black/white/green colour scheme amazingly does actually seem to work. It’s neat and tidy. The action isn’t bad but with a 7kg (15.4lbs) flywheel it should be smoother than it is. Even the less bulky members of the team found an uneven action at the point of no return in the cycle, experiencing a slight speeding up of the motion. The 12″ (30.5cm) stride feels fine when in the sitting position on the bike but feels a little restrictive when using the Active 120 as a cross trainer. There’s just something about the motion here that doesn’t feel quite right. One suspects that it’s down to the way the motion speeds just at the point of passing the point of no return. There are 16 levels of resistance, controlled via the console that provide a decent enough range of difficulty settings. Moving between resistance levels is fairly quick from one level to another and as there are only 16 levels rather than the standard 32 this is both a benefit and a drawback. The upside is that it’s quick to go from one discernable level difficulty to another, the downside is that it’s harder to find the goldilocks zone. The machine itself is stable enough with only a bit of movement throughout the cycle when using it as a cross trainer. When using it as a bike, it’s solid and feels very sturdy. The console is a black 5.75” (14.5cm) LCD with a monochrome display featuring 12 preset programmes plus a user-defined programme, manual and range of target heart rate workouts. There’s also the welcome addition of recovery, body fat and BMI tests which work reasonably well but unfortunately, there are no user profiles so it’s not possible to tailor the results based on individuals. The downside of this is that the results you get are based on ‘average’ user details. This means that the results you get won’t vary as much as they should between a 20-year-old female and a 60-year-old male. Still, it’s a nice feature to have and does give you a reasonable indication which is more than you’ll see on a lot of other machines at this price point. The 12 preset programmes are customisable, allowing you to increase or decrease the difficulty of the overall programme which is nice and the there are also watt and user defined programmes that are easy to set up. In addition, there are quick settings for the target heart rate workouts so the Active 120 does offer up a decent set of training options so you shouldn’t get bored with it as time goes on. One major drawback in terms of the target heart rate workouts is the lack of wireless heart rate receiver and the lack of pulse sensors on the moving handles. It’s well known that hand pulse sensors don’t provide a very accurate heart rate reading so fundamentally this programme doesn’t work all that well, but the real deal breaker here is the lack of pulse sensors on the moving handles. This means that the target heart rate programmes can only be used while holding onto the fixed handlebars, completely excluding the possibility of using the Active 120 as a cross trainer to do target heart rate training. Of course, this doesn’t mean much if you’re not bothered about such things but from an overall perspective, it does mean you can only do heart rate training on the exercise bike part of the machine. You can change between cycling and cross training during a workout and the unit is stable enough to do this and feel safe while transitioning between one type of workout and the other. Like on other 2 in 1 models we’ve tested, trying to sit down and keep a hold of the moving arms is a complete non-starter, unless you have extraordinarily long arms. We did try sitting and holding onto the moving arms but it just doesn’t work. 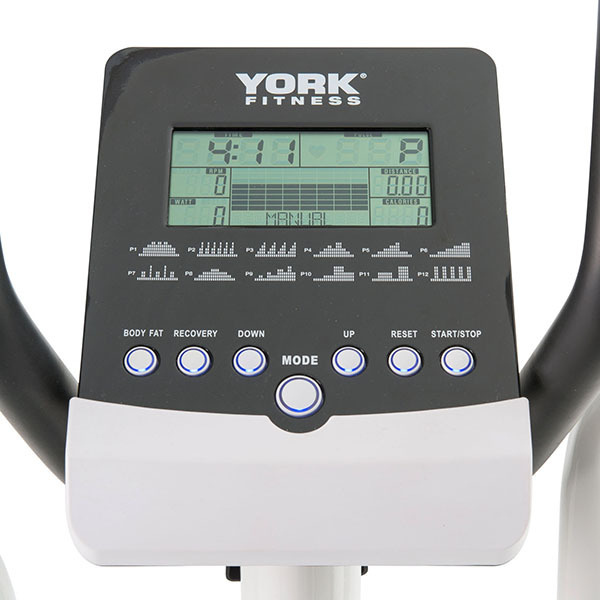 The York Active 120 2-in-1 cross trainer/exercise bike really is somewhere in between both types of machines. It does the job reasonably well but in our opinion, there are other machines similar to this model on the market that do a better job. If you do take the plunge you’ll benefit the most from the tiny amount of floor space it takes up and from a wider range of exercises that either a bike or a cross trainer on their own will provide. Lastly, the warranty on this model is 12 months parts and labour which is, at least, 12 months shorter than it’s competitors. 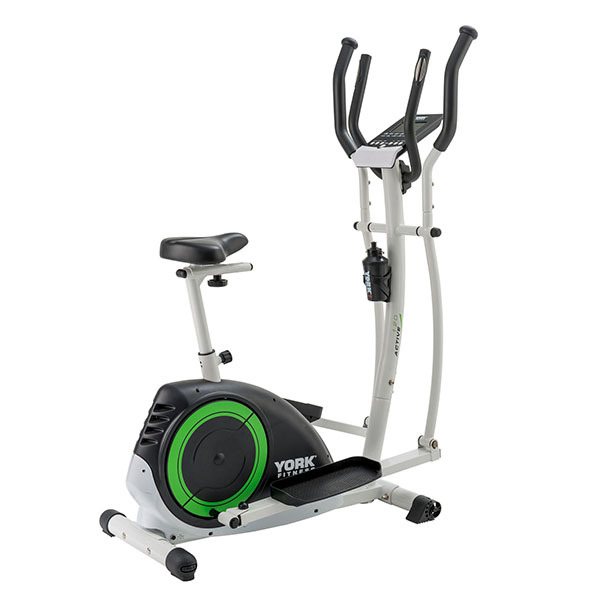 The York Active 120 2-in-1 cross trainer/exercise bike offers a space-saving fitness solution and 2 types of exercise in one machine from a trusted brand. This machine is a good choice if you're looking to improve your mobility or have limited space and want to get as much of an all-round workout without filling your home with fitness machines! However, if you're considering this machine, we'd highly recommend having a look at the Viavito Setry: A similar machine with a superior console that's currently on offer for a good deal less!